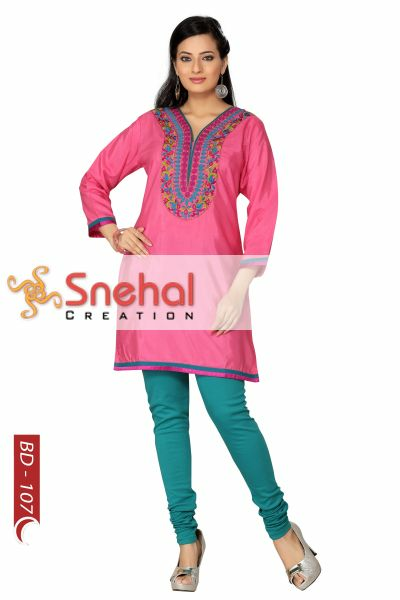 Every day is a delight with this fashionable art silk tunic created especially for a woman of your kind; by Snehal Creations. The alluring kurta comes in fine quality art silk fabric and with a V-neck design. An assembly of multi-coloured embroidery lines the neck in a panel of sorts. The long sleeves of the kurta are perfect to shield you from scorching heat and evening chills. The contrast blue taping provides adequate finishing at edges. Choose a colour from the embroidery and pick a legging of the same colour to team with it.